As an iPhone user, you may have encountered this annoying iPhone stuck on Apple logo problem, like most of us. Your iPhone may get stuck on the Apple logo white screen during an iOS update or other reasons, you cannot get it pass and even by pressing the home button. Don't get despondent anymore, because in this article, we're going to show you how to fix iPhone stuck on Apple logo issue efficiently, and you may gain more than that. Now let's move on. Part 1: Why My iPhone is Stuck on Apple Logo? Part 2: How to Fix iPhone Stuck on Apple Logo? Part 3: Is it Possible to Recover Data Lost Due to Stuck iPhone? Updates, Restores and Transferring Data - Updating the iOS version affect the functionality of the firmware hence the iPhone stuck on Apple logo during update issue. Concerning restoring and transferring data, there may be some sort of software corruption in the process, not because of the apps, but something that may interfere with the hardware, causing the iPhone to be stuck on Apple logo. Jailbreaking - This gives apps on the iPhone, unrestricted access to the iPhone, by-passing the iPhone's security protocols. This, in turn, may lead to apps affecting and interfering with the core functionality, especially during startup, hence the issue. Hardware Issues - Faulty USB ports and cables may all cause issues, especially when transferring data. Other issues may be due to the iPhone drowning in liquids or getting broken. This may cause an issue during startup as while the firmware is checking the hardware, it will encounter an issue with damaged hardware, leading to the iPhone getting stuck on the Apple logo. Note it is better to take the iPhone to Apple's Technical Support Team to assist with the issue, but before doing so, you may also try the following four quick and easy ways. Some might also be a bit complex. For all iPhone 6 and former, hold down the power button while pressing the home button, until the iPhone restarts - The Apple logo will have to first disappear then reappear. On iPhone 7 and 7 Plus, hold down the power button while at the same time pressing the volume down button. 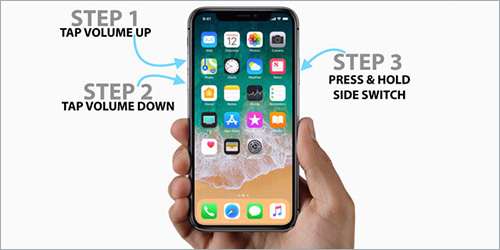 For iPhone 8, iPhone X, iPhone XS (Max), XR, start by pressing the volume up button, then the volume down button and finish by pressing and holding down the side button. Step 1. Connect your iPhone device to the PC, and then open iTunes app on the desktop. Ensure that your iTunes has been updated to the latest version. Step 2. Similar to the Hard-Reset, this step depends on the models of your iOS device. 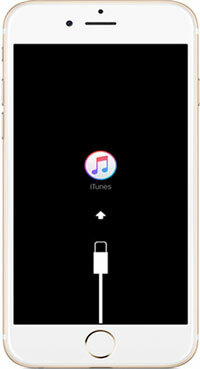 For the iPhone 6, later versions or iPad, you may release the home button; For iPhone 7 and 7 Plus, you will have to power of the device, then press and hold the side button until the iTunes connect prompt displays on the screen; iPhone 8 and 8 Plus, X, XR and XS, press the volume up button, then the volume down button-all these should be done instantaneously-then conclude by holding down the side button till the iPhone displays the recovery mode screen. Step 3. At this point, you have got two options, either restore or update the device after putting your iPhone in the recovery mode successfully. Now click the "Restore" button and follow the onscreen instruction to restore your iPhone and resolve iPhone stuck on Apple log problem. Step 1. Connect your device to a PC and launch iTunes. Step 3. At this point, ensure that the screen remains black or dark, without displaying anything. If not, the device hasn't entered DFU mode and you may have to start the whole process all over. Step 4. 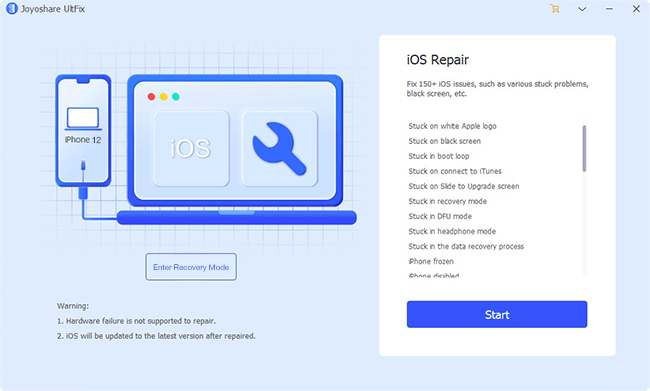 Once in the DFU mode, the device should connect to iTunes and a prompt to perform a restore or a complete restore to factory settings will be displayed. Click the "OK" button and then hit the "Restore" option to put your iPhone in the DFU mode. Truly, an iPhone stuck on Apple logo can be repaired back to normal with the help of one iOS system recovery tool, like Joyoshare UltFix. Such a professional iOS repair tool can let you escape from the white Apple worry free. Most importantly, it allows you to quickly enter/exit the recovery mode with only one click without any charge. Want to see how it performs? Let's have a close look now. Step 1. Simply launch Joyoshare UltFix iOS System Recovery on desktop and then get iPhone plugged into computer. After iPhone is connected and detected successfully, you can click on "Start" button to continue. Step 2. Go to select "Standard Mode" to repair iPhone stuck on Apple logo without data loss. Afterward, press on "Next" button and go forward to set iPhone into the recovery mode or DFU mode as instructed. Step 3. When your iPhone is in recovery/DFU mode, you can confirm the device info, including device model, iOS version, etc. and get down to downloading and verifying the firmware package patiently. Step 4. It will take a while to complete the whole downloading and verification process. After that, tap on "Repair" button at the right bottom to let Joyoshare UltFix fixes iPhone back to normal in a secure manner. If your iPhone is stuck on Apple logo and consequently your data is risky to be lost. At this moment, using a third-party data recovery tool is an effective method, and it is competent to get back data lost on damaged or stuck on Apple logo iPhones. 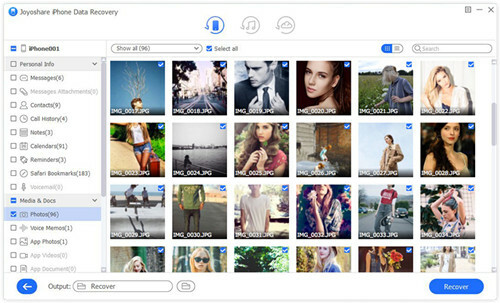 One of the best and highly suggested software is Joyoshare iPhone Data Recovery. This is fast, highly reliable and is easy-to-use iOS data recovery utility. You can recover data lost from catastrophic scenarios such as stuck on Apple logo, water damage, a broken screendevice or even a stolen one, etc. 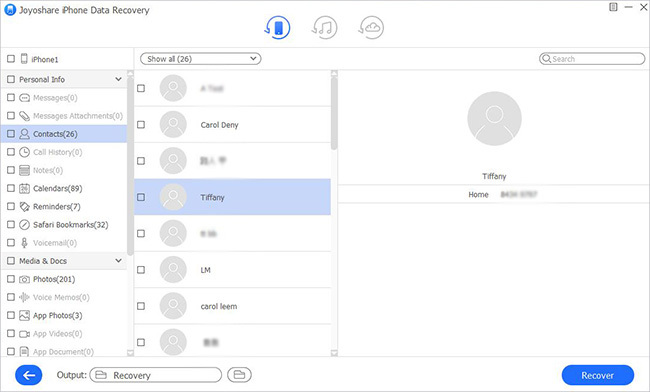 It also supports to recover lost iPhone text messages, contacts, call history, notes, photos, videos, WhatsApp messages, Viber and Kik data, and other numerous files. Another good thing is that this data recovery software can recover data lost from iDevice without backup or iTunes and iCloud backup files. Next let's see how to use Joyoshare iPhone Data Recovery to recover lost data due to your iPhone stuck on Apple logo issue. This is data recovery software for both Windows and Mac users and can thus be used on any PC and Mac. 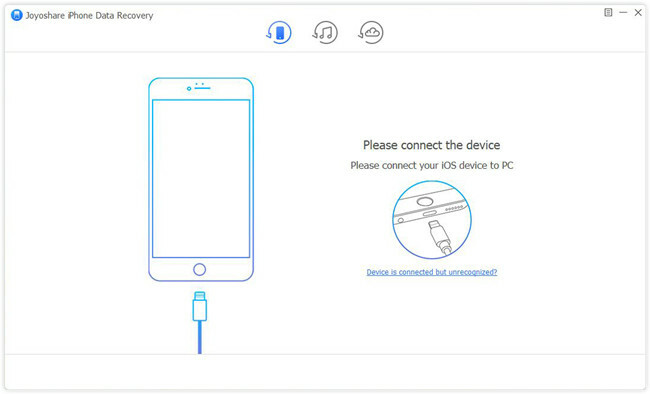 To start off, proceed to download the software form the Joyoshare iPhone Data Recovery official website, install and launch the software. Connect your stuck iPhone to the computer, and select a recovery mode accordingly. 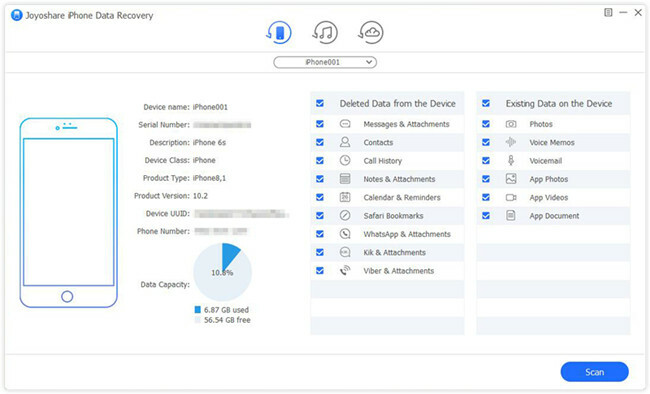 As long as your iPhone can be recognized by Joyoshare, you can choose to "Recover from iDevice" mode to start recovering the lost data from iPhone directly. Otherwise, go to the "Recover from iTunes" or "Recover from iCloud" to restore missing data from iTunes/iCloud backup. Tick the data types you'd like to recover and then hit the scan button and all data lost, or still within the device will be shown once scanning is over. Owing to the speed of the software, the process is over in just a couple of minutes and the lost data is recovered. All the data recovered including that still existing on the device will be displayed in different categories. You can filter or separately search using the Search Box for the retrieved lost data and hit the "Restore" button to get back your data and save them to the local folder of your computer. If you have meticulously followed the above procedures, you are sure to get your iPhone fixed. It is worth mentioning some bonus tips. That is, it is good to always back up your data. Also, make sure to first have your device checked by Apple to fix iPhone stuck on Apple logo and finally research about the issue causing the iPhone to get stuck on Apple logo white screen. This is to have more knowledge concerning the issue on the next time it occurs. Surely, if conventional solutions don't work, a trustworthy and efficient iOS system recovery software can be put to good use. Moreover, using Joyoshare iPhone Data Recovery is also one of the most highly recommended methods to get back data from damaged iOS devices, as it is comprehensive and has been thoroughly tested. [Fixed] iPhone Stuck in Recovery Mode?